Hot, sunny weather in Hawke’s Bay is budding well for another high quality apple crop as the trees reach full bloom. One of New Zealand’s largest apple growers, BOSTOCK New Zealand is expecting a solid season in 2017. BOSTOCK New Zealand Owner John Bostock says the outlook is positive thanks to mild weather and few frosts. “Warm, dry conditions are ideal when trees are in bloom – we have had some really hot days in Hawke’s Bay, with temperatures reaching the mid 20s and indications show it’s a strong bud. It’s an exciting time for BOSTOCK New Zealand as new varieties will start to produce fruit with higher colour and sweeter taste, geared towards consumers in Asian markets. 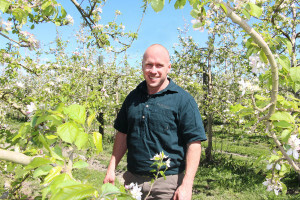 Bostock New Zealand planted up big in new varieties during the winter months, replacing old apple varieties. The new apple tree varieties include Premier Star, TCL3 and Kingsbeer Red. “We will be getting the first samples of these new crops this coming season, so we are excited to meet the international consumer demand with bright red, sweet, juicy apples,” said Mr Bostock.